The federal government says that Congress, in amending the Marine Mammal Protection Act in 1994, left federal agencies to decide whether or not lethal removal action might be necessary to control sea lion predation on protected fish stocks. In contrast, the Humane Society of the United States, in recent filings in Oregon's U.S. District Court, says NOAA Fisheries has wrongly judged that California sea lions, which congregate in the lower Columbia River estuary in late winter and spring, are thwarting efforts to recover five of the 13 basin salmon and steelhead stocks that are listed under the Endangered Species Act. The legal arguments presented in late July by the HSUS and this week by the federal government resume a debate over whether the states of Idaho, Oregon and Washington should be allowed to remove California sea lions known to prey on salmon below the lower Columbia River's Bonneville Dam. The dam, located at river mile 146, is the first hydro project spring chinook salmon and steelhead must negotiate as they head upstream to spawn, and in recent years has been a gathering point for male sea lions aiming to feed and gird for the summer breeding season. The states were in March 2008 first granted permission to remove sea lions known to feed on salmon below the dam. That authority approved by the Commerce Department's NOAA Fisheries was revoked late in 2010 by a federal appeals court. The U.S. Court of Appeals for the Ninth Circuit said NOAA had "not offered a satisfactory explanation for its decision. The court said the agency has not adequately explained its finding that sea lions are having a 'significant negative impact' on the decline or recovery of listed salmonid populations given earlier findings by NMFS that fisheries and dam operations that cause similar or greater mortality among these populations are not having significant negative impacts. The Nov. 23, 2010 decision also said "the agency has not adequately explained why a California sea lion predation rate of 1 percent would have a significant negative impact on the decline or recovery of these salmonid populations." The 2008 decision had said the removal program would be discontinued if observed predation on salmon in the area below the dam dropped below 1 percent. Congress' 1994 amendment to the MMPA, Section 120, allows NOAA Fisheries to authorize the lethal take of "individually identifiable" sea lions that are having a "significant negative impact on the decline or recovery" of listed salmon and steelhead. The federal agency reissued the authorization in March, saying it had addressed the concerns expressed by the Ninth Circuit. The HSUS immediately responded with a complaint filed in U.S. District Court that says the new authorization contains the same flaws as the discredited decision from 2008. The HSUS motion for summary judgment filed July 23 asks that the district court declare illegal NOAA's March decision. In response, a summary judgment motion filed Wednesday by the U.S. Department of Justice asks that NOAA Fisheries' authorization decision be upheld. "In amending the MMPA in 1994 to add Section 120, Congress expressly determined that, in the precise circumstances at issue in this case, the protection of ESA-listed salmonids must take precedence over protection of healthy populations of pinnipeds," according to the federal government's Aug. 22 memorandum in support of its request for summary judgment. 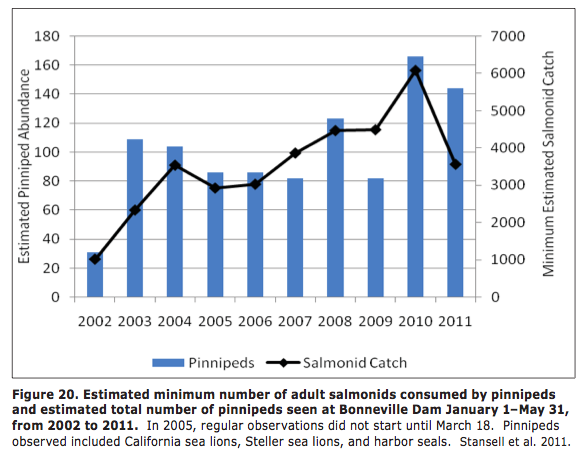 "In issuing the 2012 LOAs, NMFS heeded this direction by giving careful consideration to the requirements of Section 120, the facts as they exist at Bonneville Dam, and the science relating to the impact of pinniped predation on ESA-listed stocks. This is exactly what is required of NMFS under the law," the federal brief says. "Plaintiffs' instant challenge, by contrast, is premised on mischaracterizations of the administrative record and the agency's rationale, disagreement with the agency's scientific judgments and policy determinations, and, ultimately, fundamental opposition with Congress' decision to permit lethal removals to manage emerging conflicts between pinnipeds and at-risk salmonids. While it is unfortunate that such pinniped-fishery conflicts exist and require difficult decisions to be made, Plaintiffs' opposition to the use of lethal removal authority provides no basis for setting aside the lawful and reasoned determinations of NMFS." HSUS, on the other hand, says the NOAA Fisheries' decision violates the ESA, MMPA and National Environmental Policy Act by allowing the killing of sea lions "for doing what comes naturally - eating fish. . .."
The MMPA's Section 120 "provides a limited exception to the MMPA's otherwise strict prohibition on the killing or harassment of any marine mammal," the July 23 HSUS memo says. The most recent NOAA Fisheries decision fails to answer the questions posed by the Ninth Circuit, according to the HSUS. "In an effort to justify its conclusion, NMFS has decided that sea lions in the Columbia River must be killed because their feeding, taken as a whole, has a 'meaningful' and 'not insignificant' effect on the number of listed salmonids," the HSUS memorandum says. "Glaringly absent from the agency's decision, however, is what effect the sea lion feeding actually has on the decline or recovery of salmonids - the legal test required under Section 120 of the MMPA, and evidently a question that NMFS simply cannot answer. Instead, the agency utilized a series of factors specific to unique facts presented here, which amount to little more than its list of rationalizations for why killing sea lions might be a good idea, in an attempt to re-write the statutory standard to fit NMFS's desired outcome." The California sea lion removal program below Bonneville conducted by the states in April and May this year resulted in 12 of the animals being taken from the scene. Eleven were lethally removed and one shipped to a Midwest aquarium. The state project aims to reduce predation on listed salmon. A total of 38 California sea lions were removed in 2008-2010 with 10 going to zoos aquariums and the rest being euthanized.